SITUATION The property is situated in a secluded position approximately 0.8 of a mile from the historic town of Westerham, TN16. Westerham enjoys a good range of shopping facilities, antique shops and excellent restaurants, bars and pubs. The larger towns of Oxted and Sevenoaks are approximately 4 and 7 miles distant both providing mainline rail services: Oxted into London Victoria and London Bridge. Sevenoaks into Charing Cross/Cannon Street. The M25 is easily accessed nearby at junction 6 approximalty 5 miles distant. Gatwick Airport can be reached in 35 minutes from the property. ENTRANCE HALLWAY Front door leading to an impressive entrance hallway with parquet flooring, a large radiator, a carpeted staircase leading up to the first floor, dado rails, a large under-stairs cupboard and doors into the various rooms. STUDY 10' 8" x 9' 9" (3.25m x 2.97m) The study has a front facing double glazed window, hardwood flooring, a covered radiator plus fitted storage units and draws. KITCHEN/BREAKFAST ROOM 30' 2" x 14' 4" (9.19m x 4.37m) An impressive space with a range of base and wall units with granite worktops, a centre island with storage underneath, a front facing double glazed window, a double butler sink, tiled splashbacks, an integrated microwave, space for an American style fridge/freezer, LED downlights, a five burner range cooker with an electric hood, an integrated dishwasher, hardwood flooring, a feature fireplace, two radiators, dado rails, LED downlights, double doors opening externally onto the rear patio and doors into the boot room and the entrance hallway. DINING ROOM 17' 4" x 13' 11" (5.28m x 4.24m) An impressive dining room with polished hardwood flooring, two rear facing double glazed windows, two radiators, a feature fireplace, dado rails and cornicing to the ceiling. There are two doors into the entrance hallway and double doors opening through into the drawing room. DRAWING ROOM 22' 0" x 16' 10" (6.71m x 5.13m) The drawing room has polished hardwood flooring, double doors opening rearward onto the patio, twin aspect double glazed windows, a feature fireplace with a wood-burning stove, detailed cornicing, fitted storage units, two radiators, a door into the entrance hallway and double doors opening through into the dining room. SITTING ROOM 20' 7" x 12' 5" (6.27m x 3.78m) A cosy space with carpeted flooring, a feature fireplace (gas), fitted units, twin aspect double glazed windows, two radiators, LED downlights and double doors opening externally out onto the garden. CLOAKROOM A handy downstairs cloakroom with tiled flooring, a radiator, a pedestal basin, two double glazed windows, a radiator and a W/C. CONSERVATORY/GARDEN ROOM 19' 9" x 18' 1" (6.02m x 5.51m) A fabulous room with a panoramic view of the rear garden, tiled flooring, seven radiators, a vaulted ceiling with exposed beams and access to the garage and the storeroom. MASTER BEDROOM 16' 11" x 13' 11" (5.16m x 4.24m) The master bedroom has twin aspect windows overlooking the rear garden, carpeted flooring, a radiator, picture rails and a door into the ensuite. MASTER ENSUITE + DRESSING ROOM The ensuite has tiled flooring, a large bath, a bidet, a pedestal basin, triple aspect double glazed windows, a shower cubicle, an extractor fan, LED downlights, a radiator, a W/C and a door into the fitted dressing room. BEDROOM TWO 17' 5" x 14' 4" (5.31m x 4.37m) Adjoining bedroom seven this double aspect large second bedroom has an ensuite bathroom. The room has an impressive vaulted ceiling with a single Velux window, single radiator, carpeted floor, multiple power points, a television aerial socket and breathtaking views. ENSUITE TO BEDROOM TWO Ensuite to bedroom two with vinyl flooring, a large hand basin, a bath with power shower, a heated towel rail, a low level flush W/C, a single Velux window, ample storage space and LED lighting to the ceiling. BEDROOM THREE 15' 5" x 13' 10" (4.7m x 4.22m) Third bedroom with large twin aspect double glazed windows, large built in sliding-door wardrobes, two radiators, beautiful views over the garden and grounds, numerous power points and a television aerial connection. BEDROOM FOUR 14' 9" x 10' 10" (4.5m x 3.3m) Fourth double bedroom with carpeted flooring, a rear facing window with beautiful views over the gardens and grounds, a single radiator, multiple power points, television aerial connection and space for free-standing furniture. 1ST FAMILY BATHROOM The first of two family bathrooms on the first floor. The room has tiled flooring, LED lighting, a large bath with a separate shower cubicle, a heated towel rail, an extractor fan, a low level flush W/C and a large granite/composite hand basin. BEDROOM FIVE 13' 10" x 9' 11" (4.22m x 3.02m) Fifth double bedroom with stunning rear views over the garden and grounds. The room has carpeted flooring, a single radiator, multiple power points, a television aerial connection and space for free-standing furniture. 2ND FAMILY BATHROOM The second family bathroom on the first floor has tiled walls with a heated towel rail/radiator, a bath with power shower attachment, vinyl flooring, a low level flush W/C and a hand basin. BEDROOM SIX 11' 11" x 9' 5" (3.63m x 2.87m) A generous single/cosy double bedroom with carpeted flooring, a single radiator, a window overlooking the driveway, a built in wardrobe and storage unit plus picture rails. 1ST FLOOR LAUNDRY ROOM Located on the first floor this large utility/laundry room has a window overlooking the driveway, vinyl flooring, a single radiator, plumbing for a washing machine and a hand basin, ample storage space and space for a tumble dryer. BEDROOM SEVEN 19' 1" x 13' 0" (5.82m x 3.96m) A comfortable double bedroom accessed through bedroom two with an impressive vaulted ceiling with Velux windows, carpeted flooring, eaves access to both sides of the room, twin radiators, multiple power points, a telephone connection point and ample space for free standing furniture. 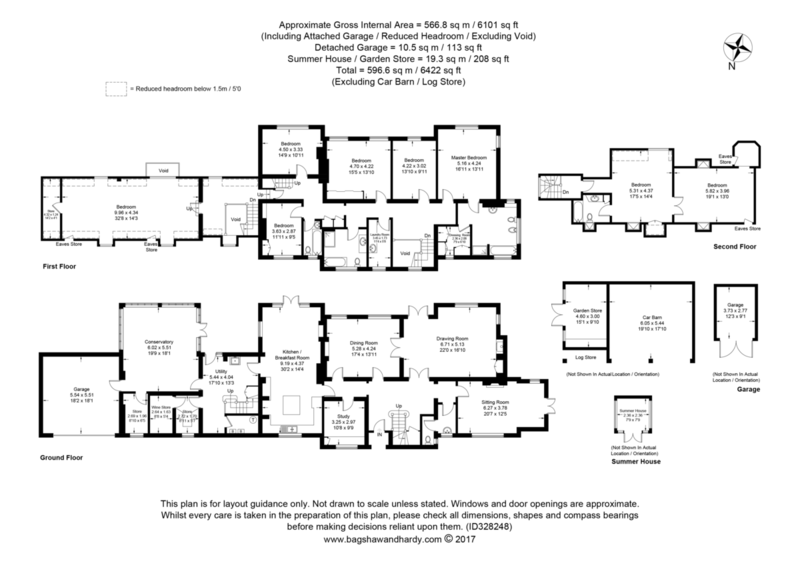 PLAYROOM/BEDROOM 8 32' 8" x 14' 2" (9.96m x 4.32m) An impressive triple aspect room used as a playroom by our current vendors with oak flooring throughout, triple radiators, eaves storage and access to a further storage room at the end. INTEGRAL DOUBLE GARAGE 18' 2" x 18' 1" (5.54m x 5.51m) A large integral double garage with a remote up-and-over door, electrics and lighting, plenty of space for the modern day 4 x 4 and a door leading through into the garden room. DETACHED TWIN CAR BARN 19' 10" x 17' 10" (6.05m x 5.44m) A detached oak framed carport/car barn accessed from the main driveway. The structure incorporates a garden store and has power and water feeds. DETACHED SINGLE GARAGE 12' 3" x 9' 1" (3.73m x 2.77m) A detached single garage with outward opening double doors, a pitched roof and working electrics. OUTSIDE To the front the property is accessed via a large sweeping gravel driveway through remote operated gates. There is access to the detached twin carport and the detached single garage. To the rear is a fabulous south facing garden with large level lawn areas, a large patio area adjacent to the house, a feature brick wall, a summerhouse, an oriental style tea house with power and heating. The plot is hemmed in with mature trees and plant borders providing a peaceful and private setting. The grounds extend to approximately 1.4 acres. SERVICES Council Tax Band: H. Gas Fired Central Heating. Mains Water. Private Drainage. Mains Electricity.